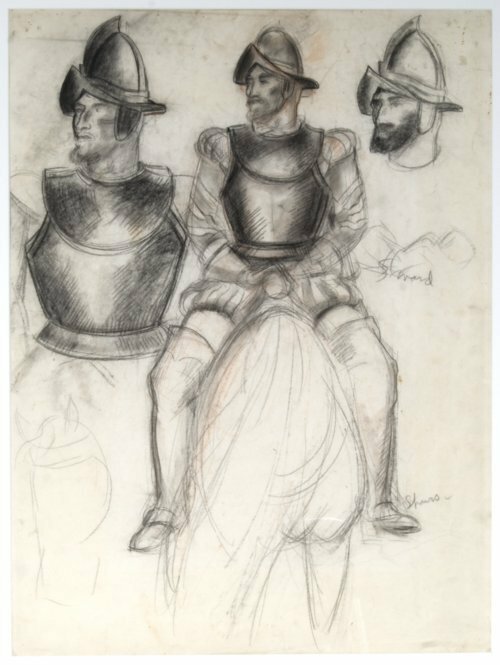 In the late 1930s artist and Kansas native John Steuart Curry produced this preliminary sketch of conquistadors for the mural Tragic Prelude housed at the Kansas statehouse. The sketch references the 1541 Spanish expedition through Kansas led by Francisco Coronado. Curry completed the mural in 1942, but due to Kansans' critical reaction he refused to complete the project. In 1993, The Wunderlich Mongerson, a Chicago-based art gallery, collaborated with Curry's widow to donate this sketch.